Over the years I have adapted and tweaked this recipe to suit my taste buds and those around me. This is a winner with everyone I cook it for (as long as the like fish!!) it’s easy and a “two pot” dish which means hardly any washing up! This recipe is for 2 so adapt where needed! 2 Large salmon fillets, skin on, bones removed. In the baking dish empty put whole bag of spinach. With a serving spoon, scoop the leeks out and lay on top of the spinach, then spoon another 6 or so spoons of water over the spinach – do not drown the spinach!! 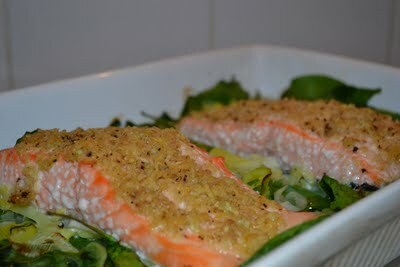 Place the salmon fillets on top of the spinach and leeks and spoon on the olive oil mixture. Set oven at 180-200 degrees and bake uncovered for 25-30 minutes. I like the salmon to be just cooked so depending on how big the fillets and how you like your fish cooked is up to you. Take from oven and let rest for 3-5 minutes. I then use a spatula and scoop the spinach, leeks and salmon out all together and place on plates. I do little roast potatoes to serve, but you could do mash or fries depending on how healthy you want to keep this dish!